When I think of change and growth, I have been asking myself what lesson am I to gain from this good or bad experience. I have been linking in my mind the words, change, choice and consciousness. I made a decision this year to listen very closely to learn more about the true reason that I am here. I have come to realize that it is for the purpose of seeing equity in our world, exploring my life and looking for areas where more truth can be revealed and to share in the raising of consciousness in my life with all lives that I touch. I learn so much from every life that touches mine. What change do I need to make today to line my life up with this purpose (or purposes)? Join us for The Essential Feminine Living Room (https://www1.gotomeeting.com/register/161980817 )for more discussions with women around the world. Life is fast and full for most of us! We go through the days like ships at sea without a compass, seemingly at the mercy of everything around us. That is when it is important to make a conscious decision to pause and realize that we are the ones responsible for our lives. We can take charge. We can find our compass, our direction, and make a difference in the world. Three steps we can take to achieve our direction are to quiet the mind, connect with the body, and evaluate whether or not we are expressing our gifts fully in the world. All three of these practical expressions can make a major difference in the quality of our lives! • Set aside time in silence at least 3 days a week for 20 minutes where you can begin to get to know yourself, your needs, your desires and aspirations. Learn to identify and trust your intuition and inner voice. We all have an inner voice that guides and directs us. We just need to listen. • Question: Can you think of one way this week that you could actually create a period of calm and stillness for yourself? • Learn to become more aware of your body’s needs. • Listen more closely to the signs that your body gives you, i.e. where are there aches, sensations and areas of tightness? Is your body sending you a message? What might the message be? • Explore these sensations through yoga or other movement you enjoy. Your body holds great information about its own healing needs and emotional state of being. 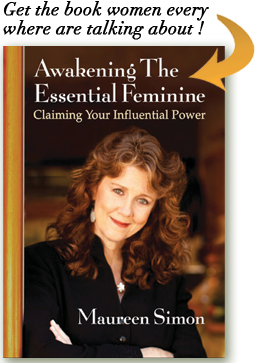 • Question: What 2 things would you need to do differently to begin to honor and care for your body in a new way? By taking these two steps, you start to walk on a path of self-exploration. You begin to get a sense of who you are and how your life fits into the scheme of things. Each of us is unique and each of us has a unique contribution to make in the world. The world today needs the contributions that are born from the qualities and gifts embodied in women. We as women need to discover these gifts and bring them forth. For What Have I Been Chosen? As John O Donohue the famous Irish writer said, “…to be born is to be chosen. No one is here by accident”. I love that thought because it deepens my inquiry as to why I am actually here! I also find the statement to be bold. Irish writers are not afraid to be bold or to think outside of the box! I know that there are many arguments that can and have been made regarding John’s statement above, but I totally agree with his wise words. The above quote comes from John’s stellar work Anam Cara (soul friend in Irish). In Anam Cara John goes on to write,” This selectivity intimates a sheltering providence that dreamed you, created you and always minds you. You were not consulted on the major factors that shaped your destiny: when you were born; to whom you were born or. where you would be born. Imagine the difference it would have made to your life had you been born into the house next door. If my life is not an accident, there must be deep meaning for my life. Am I living up to this sacred contract? How can I take my commitment to live fully to the next level?